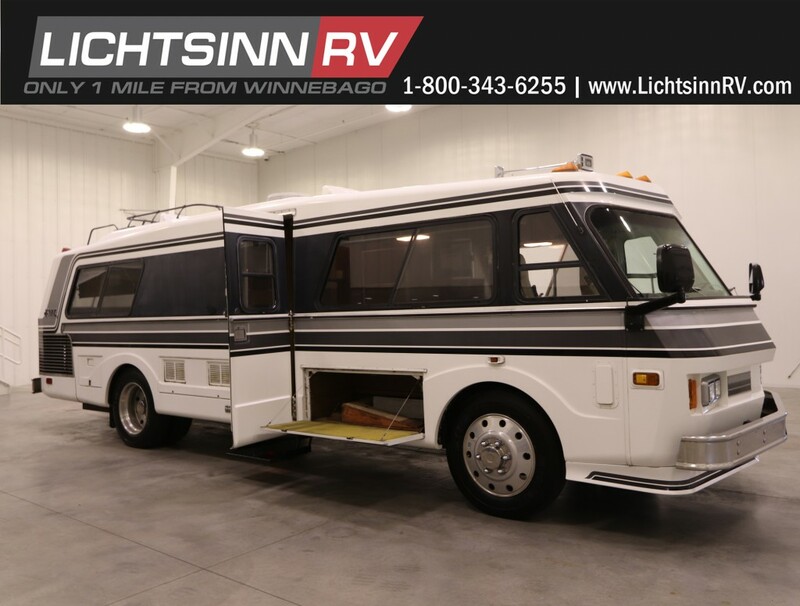 Occasionally we have super unique, vintage trades come through Lichtsinn RV and the 1975 FMC Model J we recently took in is no exception. The FMC Motorhome has an interesting lineage, FMC is the acronym for Food Machinery Corporation. FMC got its started in 1883 when inventor John Bean developed an innovative insecticide pump. The name was changed from the John Bean Manufacturing Company to the Food Machinery Corporation in 1928 when the company got into the canning machinery business. The company kept adding mechanized products and eventually started producing amphibious vehicles for the military. During a lull in its military vehicle contracts in the late 1960s, FMC turned its sights towards recreational vehicles. 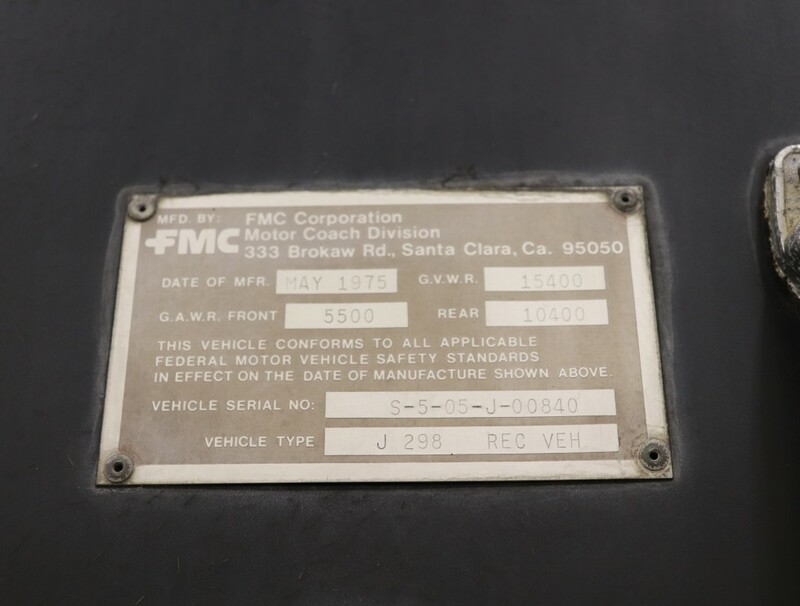 By 1972, FMC had transferred personnel from its ordnance division and formally launched a motor coach division in Santa Clara, California. Initial prototypes were 19 and 23 feet long, but neither went into production. FMC settled on a 29 foot size, and the first one was completed in late 1972. 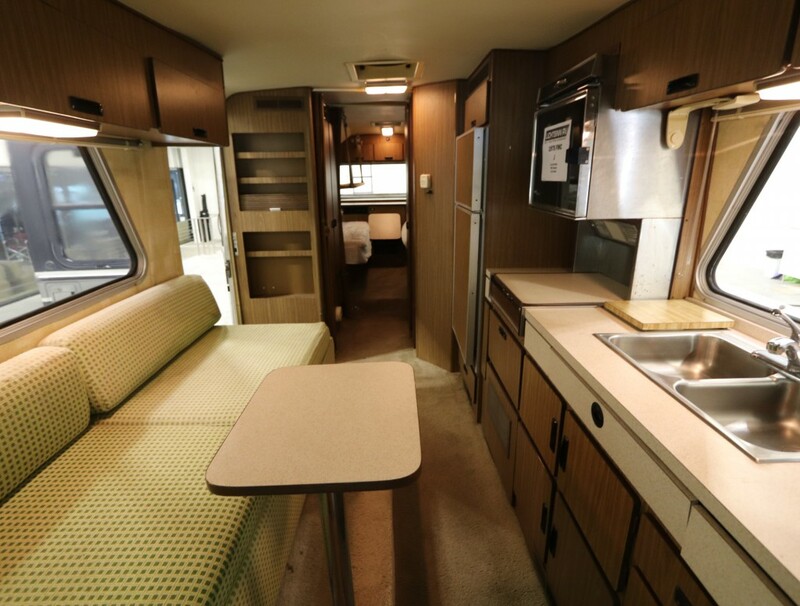 The well-made and pricey coaches, which sold for between $27,000 and $54,500 or about the same price as an average home of that era, were popular among upscale Motorhome buyers. Race car drivers Mario Andretti and Parnelli Jones owned FMCs, as did entertainers Clint Eastwood, Carol Burnett, Pat Boone and James Brolin. But the most famous FMC owner was CBS reporter Charles Kuralt, host of the popular news feature On the Road With Charles Kuralt. An FMC was the last of Kuralt’s six motorhomes. It is on public display at the Henry Ford Museum in Dearborn, Michigan. FMC coaches were manufactured from 1973-1976.
its factory to the manufacture of tanks. The FMC motor coach had reached a dead end. The final tally for the FMC was slightly more than 1,000 units, approximately 135 of which were transit buses. About half of the transit buses were eventually transformed into motorhomes. There is believed to be 7-800 units still out there. During trade in, we have taken this FMC through a major operating systems inspection. A new study conducted by CBRE Hotels Advisory Group has found that RV vacations cost much less than other types of vacation travel, even when factoring in fuel prices and the cost of RV ownership. According to the study, commissioned by Go RVing and the RV Industry Association, there are cost savings of 21 to 64 percent for a four-person travel party, while a two-person travel party saves 8 percent to 53 percent, depending on factors such as the type of RV and type of vacation. The CBRE study analyzes vacation costs using two sets of hypothetical travel groups: a four-person travel party of two adults and two children, and a two-person travel party of two adults. CBRE analyzed major costs these hypothetical travelers incur traveling to nine popular vacation destinations. For each destination, researchers analyzed vacations lasting 3, 7 and 14 days. The study compared different methods of travel, including a folding camping trailer; a lightweight travel trailer; a compact motorhome; a type C motorhome; a type A motorhome; traveling in a personal car, staying at hotels/motels, and eating meals in a restaurant; traveling by airline, renting a car at the destination, staying at hotels/motels, and eating meals in restaurants; and traveling in a personal car or airline (as appropriate), staying at a rental house/condominium, and eating the majority of meals in the rental unit. 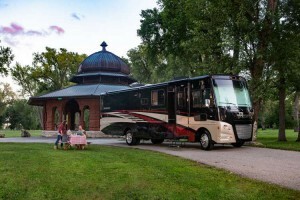 The type A motorhome, typically the largest and most luxurious RV, was compared to travel options such as flying first class, renting a premium car, staying in upscale hotels/resorts, and eating meals in restaurants. The study included analysis of how fluctuations in fuel prices could affect the economic advantages of RV travel. Researchers found that for a four-person travel party it would take a rise in fuel prices to nearly $13 per gallon for a Type C motorhome vacation to be more expensive than the least expensive non-RV vacation. None of the fuel increase scenarios for a four-person travel party resulted in other RV vacation types being more expensive than the least expensive non-RV vacation. For a two-person travel party, fuel prices would still need to rise significantly (from $5.50 to more than $13 per gallon) from current levels for RVing to lose its economic advantage. “While fuel costs are a component of the overall vacation cost, it isn’t significant enough to materially affect the outcome of our analysis,” says Kannan Sankaran, managing director of CBRE’s Advisory Services, and lead researcher. Research by Go RVing and the RV Industry Association shows that when fuel prices are higher, RVers save on fuel costs by driving fewer miles, taking trips closer to home, and staying longer in one destination. CBRE Hotels Advisory was commissioned by Go RVing to provide an objective comparison between the cost of a summer vacation using recreation vehicles (RVs) and the cost of other types of vacations during that same timeframe. CBRE factored in an estimated cost of ownership of the applicable RV equipment that was based upon published data regarding average ownership periods, residual values, annual days of utilization, insurance, and other costs of ownership, as well as any applicable tax benefits. CBRE Hotels Advisory is a division of the CBRE Group, Inc., the largest full service real estate and investment organization in the world with more than 70,000 employees located in more than 400 offices worldwide. CBRE Hotels Advisory is a leading advisory group to hospitality and real estate industry professionals. With offices in Reston, VA and Elkhart, IN, the RV Industry Association is the leading trade voice representing the $50 billion RV industry. 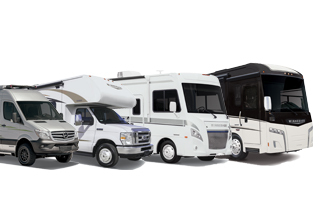 RVIA represents approximately 400 manufacturers and component suppliers producing 98 percent of all RVs made in the United States. Formed in 1994, Go RVing is a partnership between America’s RV manufacturers, suppliers, dealers and campgrounds to provide the public and media with information about the benefits of RV travel, and to cultivate a positive RV experience for all consumers. Stepping up to diesel luxury and performance has never been easier! Accessibly priced and loaded with features, the Winnebago Forza is ideal for couples or families looking to step up to the diesel pusher lifestyle. 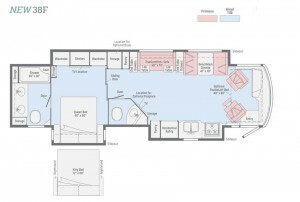 Each of the four expansive floorplans comes with elegant touches like a residential refrigerator, Corian galley countertops, walkaround queen bed, Primera upholstered Versa swivel cab seats, and an available StudioLoft bed for added sleeping flexibility. Designed to take full advantage of Freightliner’s 340-hp XCS chassis, the Forza delivers a smooth and well-mannered ride while providing up to 228 cubic feet of exterior storage, so you’ve got plenty of room for all the toys. 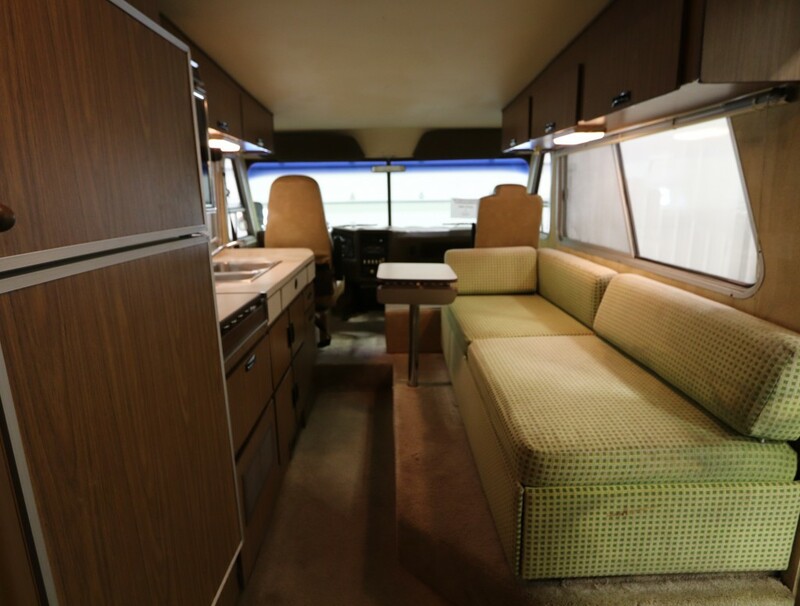 If you’re looking for diesel performance, space, and refinement while keeping a close eye on the bottom line, take a closer look at the Winnebago Forza. 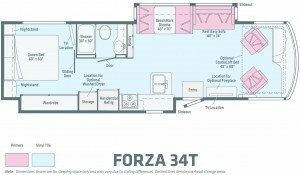 The Forza 34T comes with Dual slideouts, a mid-coach bath, RestEasy Loveseat and BenchMark Dinette make the 34T perfect for couples or small families. At 35ft. 6in. long, the 34T has sleeping options for up to 8 people, 153 cu. ft. of basement and exterior storage. 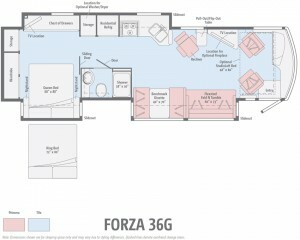 The Forza 36G comes with Triple slideouts, lots of interior storage, elegant and spacious living areas highlight the versatile 36G floorplan. Between the master queen bed, convertible Benchmark Dinette, Flexsteel Fold ‘N Tumble sofa and optional StudioLoft Bed, the Forza sleeps up to six with seatbelts for everyone. The 36G is slightly bigger than the 34T at 37 ft. 10 in. long and has 222 cu. ft. of basement and exterior storage. 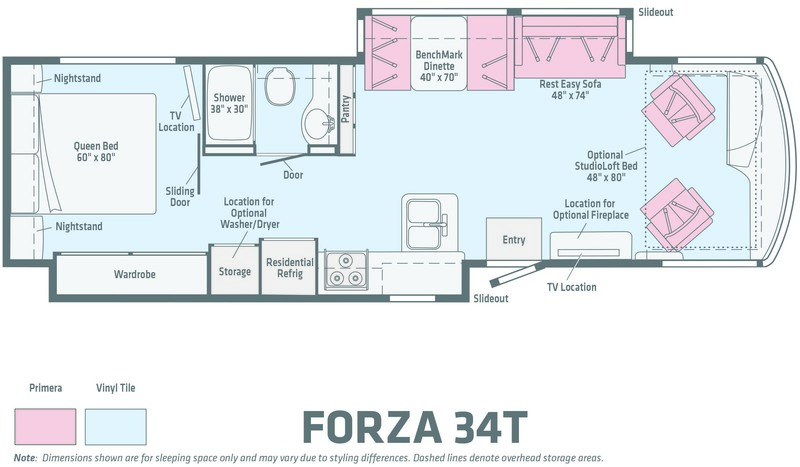 The Forza 38F’s expansive floorplan features three slideouts, including a full wall slide on the driver’s side. 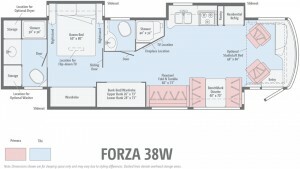 The 38F is the newest floorplan addition to the Forza lineup and features a bath and a half, perfect for entertaining. Comfort comes in many forms in the 38F, enjoy sleeping for six in the queen or king-sized bed, TrueComfort+ Sofa, BenchMark Dinette, or optional StudioLoft Bed. The Forza 38F is 40 ft. with 228 cu. ft. of basement and exterior storage. 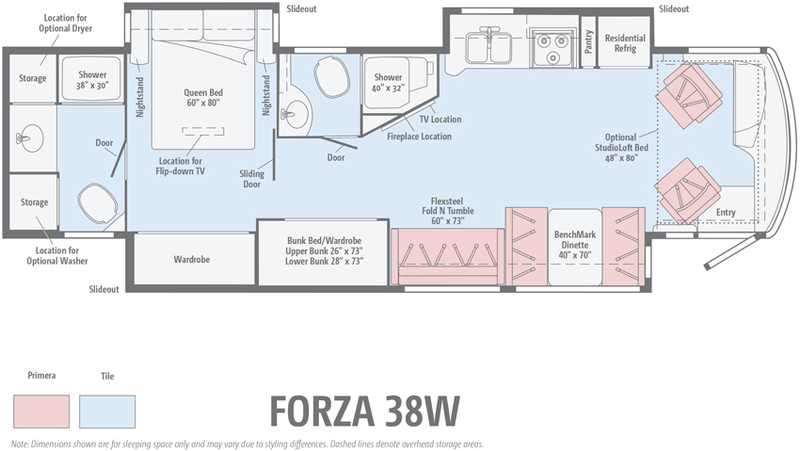 The Forza 38W features two full baths, the bunk bed/wardrobe system, a private master suite, and large living spaces make the 38W ideal for larger families or anyone who enjoys a little extra elbow room. Families will enjoy the sleeping options – a queen bed in the master suite, bunkhouse, TrueComfort+ sofa, BenchMark Dinette and optional StudioLoft bed. The 38W, like the 38F is 40 ft. long and has 228 cu. ft. of basement and exterior storage. The Forza is a great option for those looking to enter the diesel-pusher lifestyle with an accessibly priced coach loaded with features. See our Forza inventory here. Don’t forget… Forza’s qualify for Winnebago’s Carefree Diesel Living Warranty that covers your coach for 3-Years/100,000-miles. 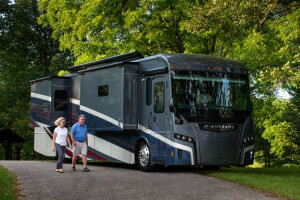 As the first-ever single axle suspension rated at 24,000 pounds, Freightliner Custom Chassis V-Ride is designed for luxury motorhome owners who want the ability to carry more gear, the freedom to equip their interiors with premium amenities, and a comfortable, confident driving experience. 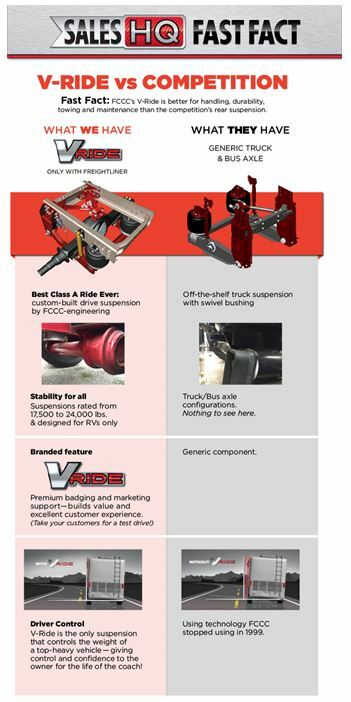 See Lichtsinn RV’s Class A Diesel inventory built on the Freightliner Custom Chassis here. Don’t forget… Winnebago’s Class A Diesel Pushers qualify for Winnebago’s Class A Diesel Living 3-Year/100,000 mile warranty. When it comes to freedom and flexibility motorhomes offer the ultimate experience. Ranging from the larger Class A motorhome to the compact Class B camper vans, to the Class C, all motorhomes are RVs that take transportation and living quarters and roll them into one comfortable experience. With something for everyone, motorhomes range from compact and space saving models to luxury buses that can all pull a family car in tow so you can zip around town for daytrips. Contact a Lichtsinn RV Sales consultant today to help you find the perfect RV for your needs!